Sunlight has a very special quality in springtime – cool, fresh and glowing. 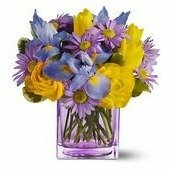 We’ve captured that breezy feeling in this mélange of bright, sunny yellow blossoms set against the tranquil hues of blue iris and lavender blooms. Best of all, the lavender glass cube vase – created exclusively for Teleflora – can be enjoyed for years to come.